As World War II progressed, captured German soldiers were increasing in numbers, and the U.S. needed to do something with them. Numerous POWs were scattered throughout the country and used as labor. Algona, Iowa was the main POW camp in the United States, and several Germans were sent to Algona Branch Camp Number 1 — located in Clay County, Minnesota, just across the river from Fargo. 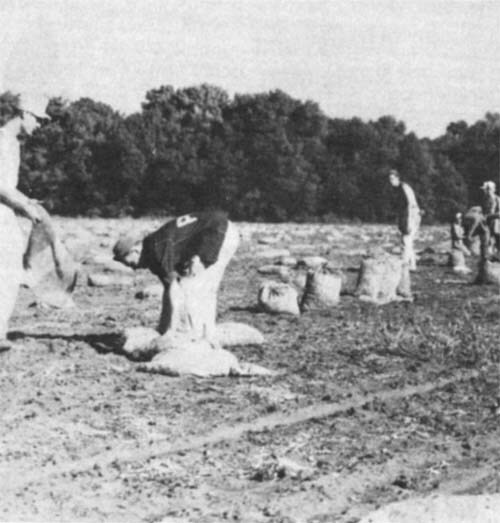 Farm labor was scarce due to the number of men recruited for the military, so POWs helped in the cultivation and harvesting of the crops. This was not a forced labor program; the German soldiers were paid for their work. The above photo was taken at on the Paul Horn farm; Horn was chosen to take POWs because of his position on Clay County’s Farm Labor Advisory Board, and the fact he spoke German fluently. From an article in the 8/78 Binford’s Guide. This entry was posted on Sunday, October 18th, 2009 at 1:30 am	and is filed under Uncategorized. You can follow any responses to this entry through the RSS 2.0 feed. You can leave a response, or trackback from your own site.